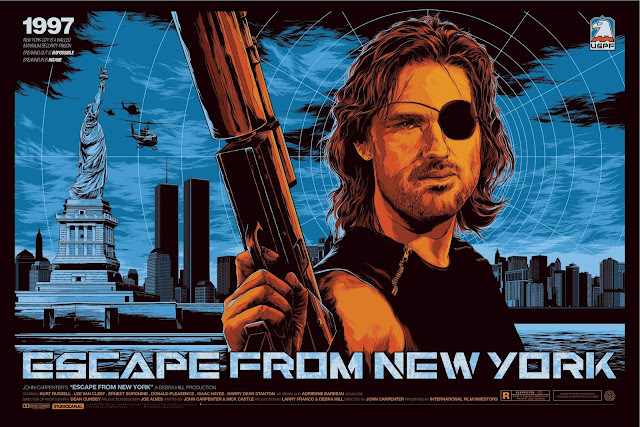 Robert Rodriguez has been announced as the newest director on the long planned remake of the John Carpenter classic Escape From New York. This remake has been in the planning stages for a while now, with rumors that Gerard Butler was going to donning the eye patch as Snake Plissken. Many more rumors ran through Hollywood before there was nothing. It appeared that the project was dead for a while. So Rodriguez is directing, but you know who else is on board this remake? John Carpenter himself. Yes, you heard that right. The originator of Snake Plissken and the whole "escaping" idea (with help from Tommy Lee Wallace. I don't want people to forget that.) is on board as an executive producer. He will have a hand in how the film is molded. This news is exciting and eye rolling at the same time. Rodriguez hasn't really made a good film in a while. The last two films he directed, Sin City: A Dame to Kill For and Machete Kills were not very good and the director has seen better days. He has directed Atila: Battle Angel, which is supposed to come out in July of this year, so maybe the execs at 20th Century Fox are liking what they see with Atila: Battle Angel and decided to give Rodriguez the job. Like I said in my Maniac Cop remake post, I am not against remakes. I, however, am a bit skeptical about this one.Sure, Carpenter is on board for this one, but he has directed a film in years and the last time he produced a remake of his own work, The Fog (2005), it didn't turn out very well. Rodriguez could bring something to the film that is fresh and new, but the whole film could be a digital mess as Rodriguez likes to focus on the technology instead of making a good film. Also, this is one of my favorite films and I would hate to see it be desecrated. I guess that we are going to have to wait until we see a trailer Atila: Battle Angel to see if Rodriguez still has some film making talent left in him.